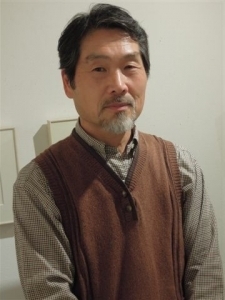 Hamanishi studied painting and graduated from Tokai University with a degree in Art, in 1973. Since then, he has been living in the Tokyo area, where his primary focus is printmaking. Mezzotint is a variation of intaglio printing--an exacting and laborious process whereby ink is transferred from below the surface of the plate by use of a press. First, the entire copper plate is indented with a toothed steel rocker tool. Worked in all directions, this creates an even finely-grained texture over the surface of the plate. Each pit will hold ink and were the plate inked at this stage, it would print almost solid black. To create the design the artist smoothes out some of the pits with a burnisher so they will hold less ink. Where highlights are required the plate is burnished and polished quite smooth. A wide range of tones are possible in mezzotint and the process can usually be recognized by a light design on a velvety black background. Hamanishi is internationally known for his mastery of this medium. He creates images with both subtle detail and dynamic composition that explore spatial relationships. His genius is in balancing calm and meditative qualities with the energetic tensions of inanimate and natural objects. Early work had such things as pipes and branches wrapped with cloth, later rope, then straw. When he moved to a more rural area, rice fields became a common element. He has also been exploring the use of color and metallic leaf in his artwork. In 2005 Mr. Hamanishis began the Haze series exploring more abstract themes using the subtle differences between matte and black inks done in mezzotint and relief printing. There is always a sense of mystery and intrigue in the complex mezzotint prints that come from Hamanishi’s deft hands. They compel the viewer to do a slow, thoughtful examination in order to fully absorb the vision the artist intends.